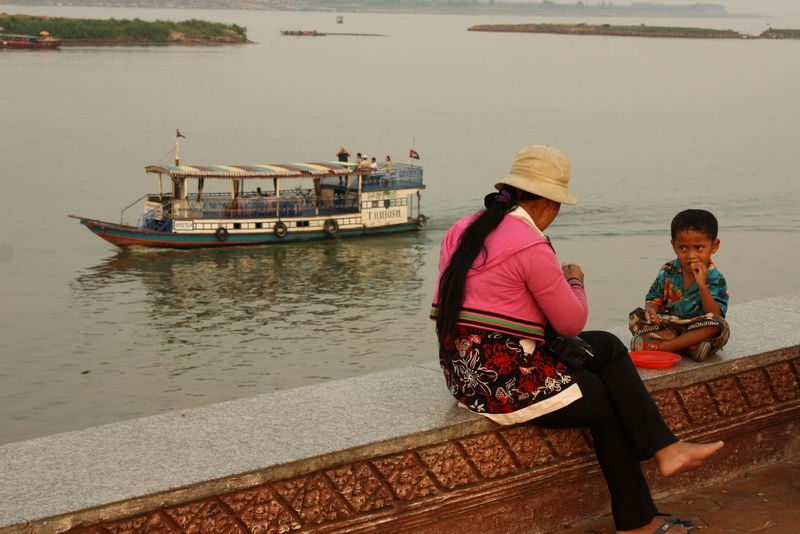 I had heard that Phnom Penh was a city that a traveler could get stuck in for awhile. Even though there aren’t as many tourist sites as say Bangkok, it is the allure of the city and the way of life that draws people in! I wanted to experience it for myself, of course while I hit the main Lonely Planet stops. 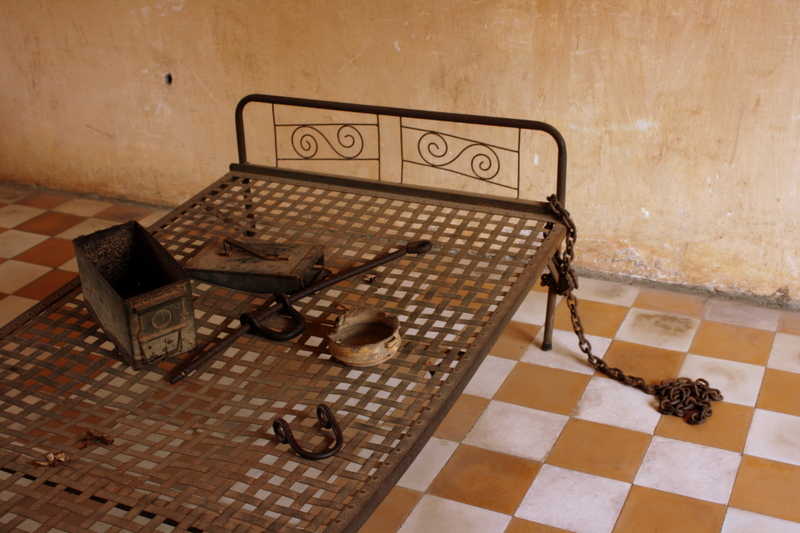 My first destination in Cambodia’s capital was the Tuol Sleng Museum. 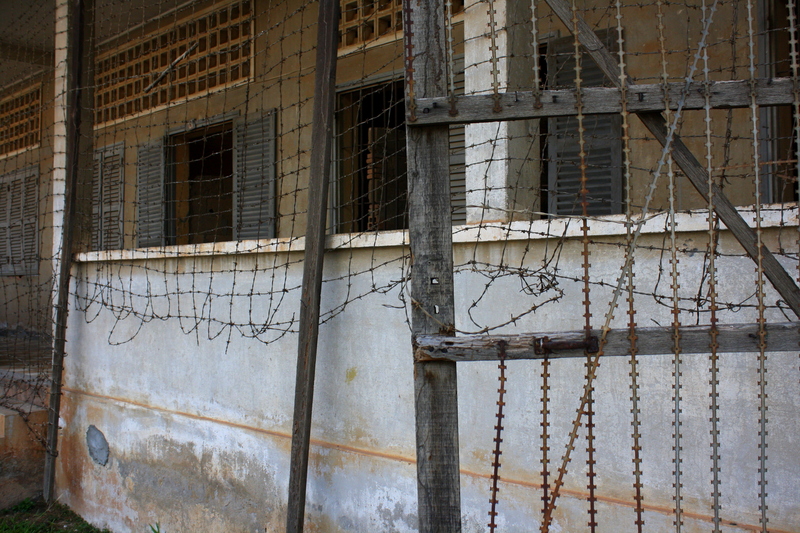 The museum was once an elementary school, but after being taken over by the Khmer Rouge, it was tragically transformed into buildings full of torture chambers, Security Prison 21 (S-21). It was their version of a concentration camp, and since I haven’t been to any of the concentration camps in Europe yet, this came as a huge shock to me. When I entered my first room, I found a disheveled bed, some torture equipment, shackles, and a picture on the wall of someone who had died in this very spot. A chill shot down my spine. I have never been in a place of death. The atrocities that had occurred here are unimaginable and as I slowly moved through each and every room, I tried not to imagine the horrors that these walls must remember. That was just Building A. Building B was next and the entire first floor consisted of rooms lined with photos of victims. Some were just mug shots. Others were taken after they had been tortured. And others were taken when they were already dead. I tried to rush through these rooms, but I couldn’t. I wanted to see everyone (although I tried to avoid the pictures of the dead). I wanted to commiserate with the victims. Their terror filled faces were tragic. I had never seen anything like it. The second floor housed rows and rows of tiny brick cells, some not even a meter across and about two meters deep, with remnants of shackles left strewn about in the small chambers. Building C was a museum with pictures of actual Khmer Rouge combatants who participated in the horrors at S-21. They were just kids! Some of the commentaries were by family members of the deceased and others were from the soldiers themselves (of course older and wiser now). Most of them claimed they didn’t know better, which I’m sure is true, and others had joined out of sheer fear for their lives. There was also a room that contained actual torture apparatuses accompanied by pictures of them being used. Quite disturbing if you ask me, but then again it went along with the theme of the rest of the museum. 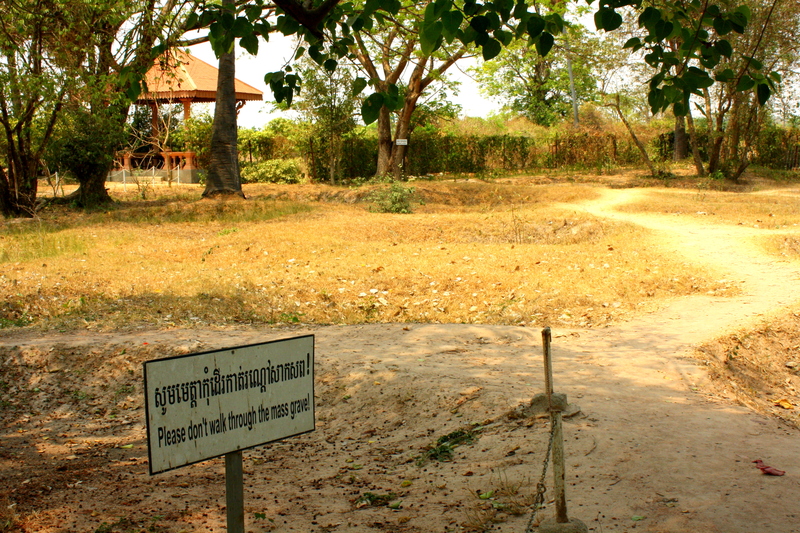 After being tortured, the victims were taken to the Killing Fields of Choeung Ek, my next stop. The memorial began with a stupa filled with skulls that were found in the fields. This was utterly mind boggling. I have never been in the presence of that many human remains. 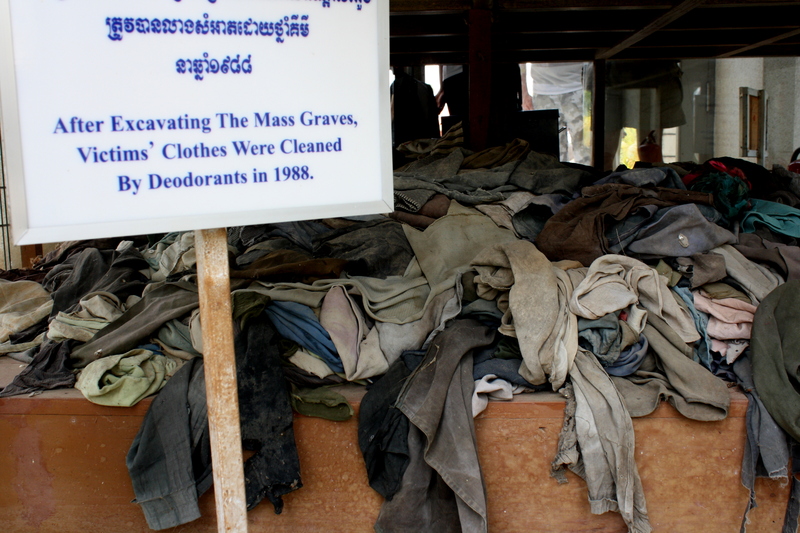 Underneath the skulls was a pile of clothes that had been scattered throughout the graves. It just put personalities to the people and really put it into perspective who these people were. Scared. Confused. Terrified. Mothers were killed with their sons and daughters in the hands. Children were killed to avoid the revenge they would surely seek for their parents. I took a walk around the complex (there is a path that follows the border of the site) I wanted to focus on revering the dead. Even though these weren’t my ancestors, they are someone’s ancestors, and being in Cambodia, I wanted to really understand the history that has made the country what it is today. On the outskirts, I was hounded by children begging for money and asking if I wanted to take their picture. Although this has happened to me hundreds of times before, it made me furious. Here I am trying to honor their dead, and they are asking me for 1000 riel. Anyways, despite that speedbump, I made it to the gravesites. They were deep holes in the earth and I couldn’t imagine being the one to have discovered the thousands of people who had been buried there. To finish up the tour, I ended with the museum which talked about those responsible for the atrocities at S-21 and Choeung Ek. Some of them admitted to it, while others denied what they did was wrong. Some of them died before justice would prevail, while others are undergoing trial. It was hard looking at the faces of evil and I quickly left. To see the brighter side of Phnom Penh, I headed over to the Russian Market, which was the market to go to in the capital. 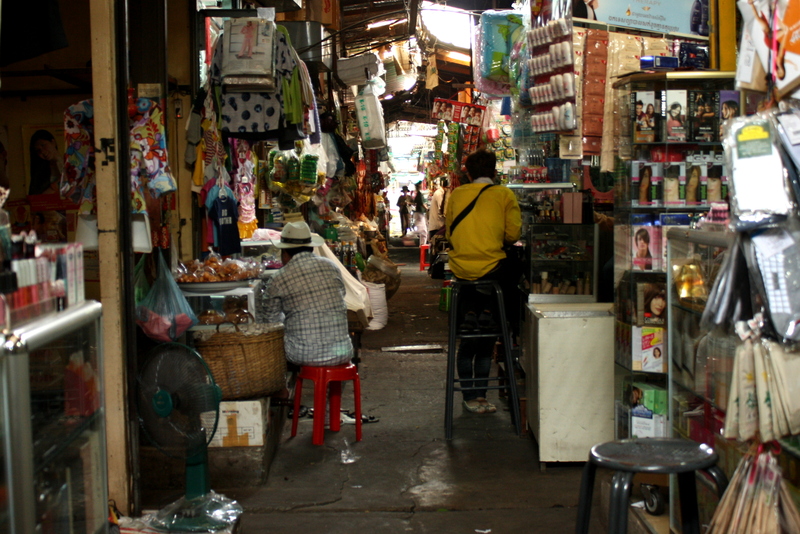 Extremely similar to the Chatuchak Weekend in Market in Bangkok, although considerably smaller, the Russian Market was rows and rows of knick-knacks, clothes, luggage, fruit, and pretty much anything imaginable under the sun. Of course, I kept finding countless treasures worth buying and after buying a bracelet from Paper wear by Friends (Fashion Jewelry made from 100% recycled paper and made by parents in vulnerable communities of Cambodia, Lao and Thailand) and an adorable monkey puppet for my five-month old nephew, I had to leave as quickly as possible or else my luggage was going to be even heavier! My last notable “Place to See” in Phnom Penh was the Royal Palace and the Silver Pagoda, which was definitely nothing to write home about and $6.25 that I will never get back. I honestly didn’t find anything too special about the place and there were way too many prohibited areas to make it worthwhile. 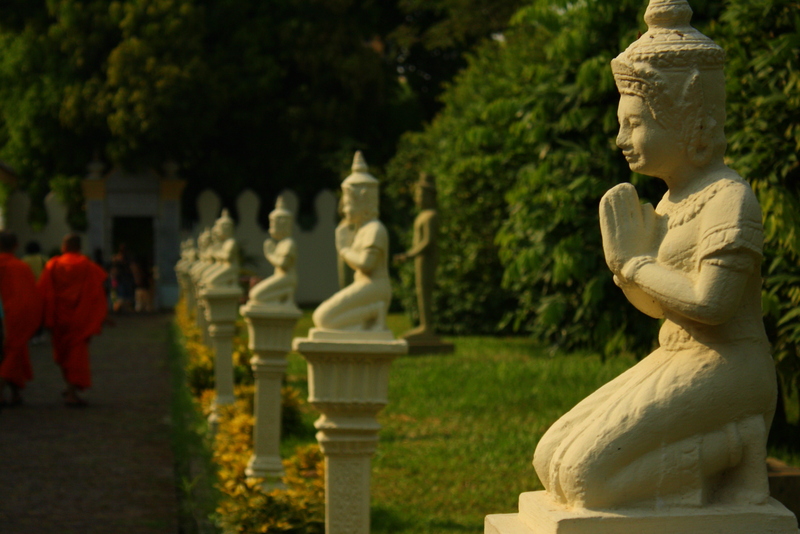 The palace grounds was peppered with buildings/temples with buddhas and other ancient pieces received by the Royal family and the Silver Pagoda was a beautiful temple with a golden standing Buddha and an Emerald Buddha. A little disappointed, I decided to take a walk along the Tonle Sap River and check out the scene down there. It was bustling with people enjoying the sunset, dancing to boom boxes, selling cockroaches, and eating noodle soup. The local setting down there was a little chaotic with countless beggars, of course taxi, tuk tuk and moto drivers, children offering to pose for pictures for money, while travelers chose from the many restaurants, shops and bars along Samdach Sothearos Blvd. I thouroughly enjoyed my short time in Phonm Penh. It would have been great to spend more time there getting to know the city better, but because there are so many amazing things to see in Cambodia, I had to move on. I definitely hope I’ll be back one day! I also had the opportunity to volunteer on my last day in the city, but I will write another post about that.